JICDRO Wishes all its Patrons A Very Happy New Year ! Taking reference from the Buddhist philosophy, Ayatanaor "sense-base" includes the mind (or "brain") as a sense organ, in addition to the traditional five. To me this addition of the mind to the commonly acknowledged five senses appears to be just logical, and that it may arise from the psychological orientation involved in us human. The mind (or brain, as most of will comprehend) is the central processing unit and the intelligence behind the perception of the said five senses. The mind is the principal gateway to a different spectrum of phenomena that differ from the physically sensed data. This leads to another pertinent question, viz, what is the difference between the mind and the brain: There are many answers to this query on the internet, but, the most convincing is the last point (pictorial) made in this section: We all know what our brain is, right? It is that three pounds of convoluted mass of gray and white matter in our heads serving to control and coordinate mental and physical actions. You may have now begun to wonder, what is the point I am trying to make. Well, the point is simple. In this fierce and non-pardoning competitive world, we professionals, feel at times that it gets to the jugular. Coupled to the fact that clients (or the people in our respective domains of work/interaction, sometimes are unreasonable, oversensitive, and (I hate to say this) make no sense. Is it too difficult to comprehend that a body without the mind/brain (as we may like to choose, but the end of this article, am sure that quite a few of us will agree that choosing the "mind" over the brain as a sixth sensory organ makes more sense) with the traditional five senses would make no reaction/response. I guess we all would agree to it. It is also agreed that human brain is a central processing unit of our nervous system. This brain sends signals to our conscious system to react. But at times we react the way we choose to (deliberately/unconsciously, as the case may be). Dr. Daniel Siegel, a professor of psychiatry makes it simpler by putting it as under: "It is a powerful lens through which we can understand our inner lives with more clarity, integrate the brain, and enhance our relationships with others. Mindsight is a kind of focused attention that allows us to see the internal workings of our own minds . It helps us get ourselves off of the autopilot of ingrained behaviors and habitual responses. It lets us 'name and tame' the emotions we are experiencing, rather than being overwhelmed by them. Our minds are created within relationships - including the one that we have with ourselves…. Each of us has a unique mind: Unique thoughts, feelings, perceptions, memories, beliefs, and attitudes, and a unique set of regulatory patterns. These patterns shape the flow of energy and information inside us, and we share them with other minds." In most of the cases, Mind is a slave of sensitivity . That's why it at times is allured to overlook the rationale of the brain (sensibility and reasonability). Which is why our Hindu philosophy stresses on training and taming our minds. Thus, in our traverse through life, whenever, we come across situations which are not to our convenience, or is distasteful (whichever the case maybe), sensitivity overpowers our mental faculty (brain and mind) and we ignore the commands processed by the brain based on the sense, sensibility, and reasonability. In our professional lives, we encounter more challenges, since we are not in the comforts of our domain. 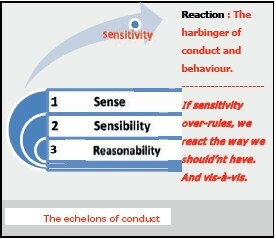 Thus, going back to the point made in the beginning, it is very important for us professionals (and otherwise as well), to train our minds and recognize our sensitivities, so as to contain our reaction, which is the sole harbinger of our reaction/reflection to the outside world. One must not forget that we all (within ourselves and the world outside) suffer with the same turmoil, viz, the lack of the art of taming our minds and realizing our sensitivities, thereby reigning in our reactions/reflections onto the outer world. Life indeed has to be lived with an art of criticism: Criticism to give and criticism to take. This can alone happen, when we master the art of training our minds, letting the brain do the thinking and controlling our actions/reaction and reflection, independent and oblivious of the circumstances and conditions. Let us aspire to make the sense, sensibility, and reasonability (the new convention); the echelons of our conduct based on the source code, be the harbinger of our conduct, by reigning in our mind and sensitivity. Wish you a successful year ahead and happy reading! Five senses. Available from: http://www.wikepedia.org [Last accessed on 2015 March 16].